A Butterfield stage wagon on the trail, early October 1858, in Arizona by William Hayes Hilton. 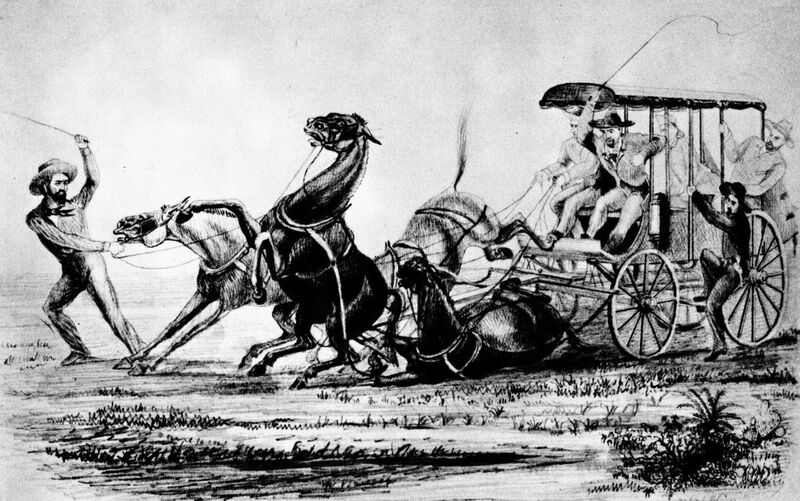 This drawing is a good representation showing the wild mules used to pull the stage wagons on the rougher sections of the trail. Some wild horses were also used. A sound balance was struck for his choice of company directors. About half were associates in Upstate New York, who also owned stage lines, and John drew on their experience to aid him in building the infrastructure for the company. It would be expensive to build and stock the trail, so he chose some directors from Adams Express, National Express, Wells, Fargo & Co. Express, and American Express. These companies would act as bankers for loans. No express companies bid on the contract, as they didn’t have the experience to build and manage a 2,700-mile stage line through the frontier of the largely unsettled southwest. 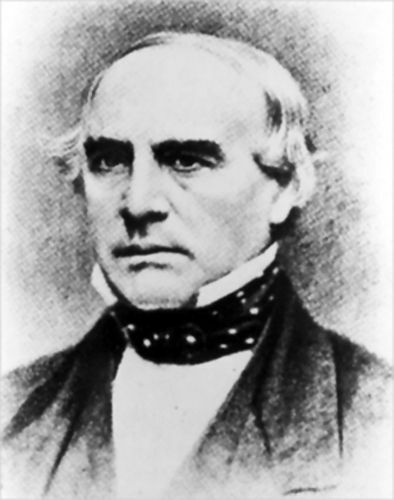 John Sr. was president of the company from its construction phase until he was voted out on March 20, 1860, because he failed to pay back to banker Wells, Fargo & Co. a loan of $162,000. This loan was necessary because the US government failed to acquire the needed funds in the latest appropriations bill to fulfill the quarterly payment. At the March 17 meeting, a resolution proposed that all assets of the Overland Mail Company be turned over to them because of the unpaid debt. John stormed out in protest and the meeting was postponed. When the March 20 meeting began, to settle the issue with John in attendance, a compromise was made for the March 17th resolution to be withdrawn and the Overland Mail Company was allowed to retain its structure and name, but John was voted out as president. William B. Dinsmore, who was also a director of Adams Express Company, was elected president. Operating finance policy making for the company would still be made by the directors, including John Butterfield, but a larger voice would now be had by those that were also directors of the express companies led by Wells, Fargo & Co. Express. Under Wells Fargo’s “back room” influence in the financial matters, the company’s services and morale suffered greatly. A scathing letter dated September 25, 1860, by Overland Mail Company assistant treasurer Hiram S. Rumfield pointed out the company employee’s displeasure. Butterfield had one year to select the route of the trail, station site, and to stock the trail before the actual start of the six-year contract on September 16, 1858. For this purpose, he chose his son John Jr. and Marquis L. Kenyon, of Rome, New York, who was also a director of the company. The company poured about one million dollars into establishing the route. In September 1858 there were 139 stations established. Many had to be built, but some existing establishments were used. When the Overland Mail Company was transferred to the Central Trail on March 2, 1861, 175 Butterfield stations strung-out along the Southern Overland Trail. 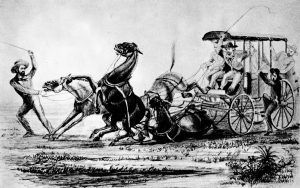 About 1,500 employees were needed and he furnished the trail with 34 Concord stagecoaches and 66 celerity stage wagons that he designed. These stages were distributed to stations about every thirty miles along the trail. The Concords would be used on the trail through the semi-settled areas from Tipton, Missouri, to Fort Smith, Arkansas, and from Los Angeles to San Francisco, California. The stage wagons would be used on the 1,920 miles of trail through the wild frontier. Butterfield never used his name on any of the stages, only “Overland Mail Company.” None of his stages exist today. Thousands of mules and horses would be needed and many used to pull the stage wagons were local wild mules and mustang horses.